ASIAN MYRMECOLOGY is a peer-reviewed, journal dedicated to the study of Asian ants. Articles are published continuously, immediately upon final acceptance. Asian Myrmecology publishes original research papers on ants in or from Asia, or with regional or global importance. All areas of modern ant research are covered, including: Taxonomy, Biogeography, Ecology, Behaviour, Life-history, Ethology, Genetics, Conservation evaluation, and Applied myrmecology. ASIAN MYRMECOLOGY is listed at ISI Web of Knowledge, CAB ABSTRACTS, SCOPUS and in OVID PS (Biological Abstracts) issued by Wolters Kluver. ISI Impact factor 2017 is 0.724. 5 years IF = 0.847. 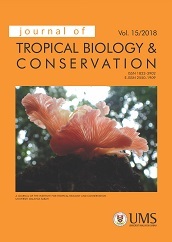 Free access to all content of volumes 1 to 9 including the online first papers! The journal main goal is to provide platform for knowledge dissemination on sustainable tourism development issues in the BIMP-EAGA (Brunei-Indonesia-Malaysia-Philippines East ASEAN Growth Area) region. The journal aims to be the leading data bank and point of reference that enrich the publications for the BIMP-EAGA region and published by BIMP-EAGA Unit for Tourism Development (BE-UTD). The journal aims to offer a platform for the presentation of scientific knowledge pertaining to the discovery of novel biological phenomena and their potential applications within a biotechnological context. The scope of the journal encompasses molecular biology and the application of molecular phenomenon associated with nucleic acids and genomics, transcriptome, proteomics, and metabolomics. Borneo International Journal of Education (BIJE) focuses on research in teaching and learning at all levels of education: pre-school, primary, secondary, tertiary as well as continous lifelong learning. Areas of interest include though not exclusively, inter alia, Education Management, Language Education, Science Education, Rural Education, Environmental Education, Early Childhood Education, Physical and Health Education, Innovation in teaching and learning, Assessment and evaluation and culture of learning. Articles can be written either in English, Malay or Indonesian languages. Borneo Journal of Marine Science and Aquaculture (BJoMSA) is an international peer reviewed journal that publishes original research contributions to marine science, fisheries and aquaculture. The Borneo Journal of Medical Sciences (BJMS) is an internationally-disseminated biomedical publication, with an aim to provide a scientific media for communication of research throughout the World. The Journal welcomes original basic, clinical, community science research on medical/health related issues in the national/ international arena. Borneo Science is a peer-reviewed international journal, free of charge and open access, published biannually by the Faculty of Science and Natural Resources (FSSA) (formerly known as School of Science and Technology, SST), Universiti Malaysia Sabah (UMS) since December 1995. The Journal covers original research and review papers in the field of Earth Sciences, Chemical Sciences, Applied Sciences and Technology, Material Sciences, Biological Sciences and Environmental Sciences. IJELP is the 12th journal of UMS since its establishment on 24 November 1994. The journal is managed by The Faculty of Psychology and Education (FPP), UMS (formerly known as The School of Education and Social Development (SESD)). The IJELP is published biannually. The journal main goal is to provide platform for knowledge dissemination on regional development issues in the BIMP-EAGA (Brunei-Indonesia-Malaysia-Philippines East ASEAN Growth Area) region. The Journal of Borneo Social Transformation Studies (JOBSTS) is an annual, peer-reviewed, and multidisciplinary research journal of social sciences and humanities. (INDEXED BY MyJOURNAL, This journal is jointly published by the Ethnography and Development Research Unit (UPEP) and Universiti Malaysia Sabah Press. The Journal of the Asian Academy of Applied Business (JAAAB) is a refereed academic journal jointly published by the Asian Academy of Applied Business (AAAB) and Universiti Malaysia Sabah. AAAB is a non-profit, academic-based association which focuses on research and development activities particularly in the areas of business, economics and management. Gendang Alam bercita-cita untuk menjadi jurnal akademik tersohor dalam hasil penyelidikan dalam bidang pengajian seni, termasuk aspek seni visual, kraf tangan, busana, penulisan kreatif, sastera, drama teater, tarian dan muzik. Jurnal ini adalah jenis peer-reviewed dan diterbitkan sekali setahun oleh Fakulti Kemanusiaan, Seni dan Warisan, Universiti Malaysia Sabah. Jurnal Kinabalu is published as a platform of choice for highlighting the work of academics and scholars. It brings together academic articles based on research and theory as well as book reviews from the humanities and social sciences. Jurnal Komunikasi Borneo ialah untuk menjadi medium utama diskusi berkaitan dengan falsafah, teori dan interpretasi dalam bidang komunikasi, khususnya, kajian di Borneo yang meliputi Negara Brunei Darussalam, Kalimantan Indonesia, Sarawak dan Sabah, Malaysia. Ia juga sebagai wadah utama dalam perkongsian hasil penyelidikan antara penyelidik Universiti Malaysia Sabah (UMS) dan universiti luar, institusi penyelidikan dan/atau Majlis Penyelidikan Borneo dari pelbagai jurusan ilmu berkaitan dengan komunikasi di Borneo. Selain itu, sebagai alternatif terbaik kepada pelajar institusi pendidikan tinggi awam/swasta (IPTA/S) dan pengkaji dalam dan luar negara untuk mengakses artikel berkaitan bidang komunikasi yang mengkhusus mengenai Borneo. Journal of Educational Thinkers is the official journal of the Faculty of Psychology and Education, Universiti Malaysia Sabah. The abbreviation for the Journal of Educational Thinkers (Jurnal Pemikir Pendidikan) is EduThinkers. Jurnal Psikologi dan Kesihatan Sosial merupakan jurnal yang merangkumi dua disiplin ilmu iaitu psikologi dan kesihatan sosial. Jurnal ini diterbitkan sekali setahun iaitu pada bulan Disember tahun penerbitan. Bilangan terbitan jurnal iaitu sekali setahun merupakan kriteria minimum yang telah ditetapkan oleh Malaysian Citation Index (MyCites). Manuskrip diterbitkan dalam bahasa Melayu atau Inggeris. Labuan Bulletin of International Business & Finance (LBIBf) offers platform for researchers and practitioners to share their findings and analytical views on issues relevant to international business and finance, both in their general and specific contexts. We welcome submission of original articles pertaining to business, banking, finance, marketing, management, economics, information technology, e-commerce, law and other topics that related to phenomenon of international business and finance. Labuan e-Journal of Muamalat and Society (LJMS) is the first online refereed journal. Introduced by the Labuan Faculty of International Finance, Universiti Malaysia Sabah, Labuan International Campus. LJMS is a scholarly journal published annually. The Malaysian Journal of Business and Economics (MJBE) is an open access journal. The MJBE is intended as a primary publication for theoretical and empirical research or modeling in all areas of business and economics. This journal invites submission of articles and book reviews in academic disciplines related to Humanities, namely modern languages, literature, history, philosophy, religion, visual and performing arts, communication studies and cultural studies. We particularly welcome manuscripts that focus on issues pertaining to Malaysia and Southeast Asia. Only manuscripts written either in Bahasa Melayu or English will be considered for publication.